This past weekend, I got up bright and early to help ForYourArt with their show and event centering around “The Clock.” Basically, for twenty-four hours (yup, a whole day from noon to noon) The Los Angeles County Museum of Art screened Christian Marclary’s film “The Clock” and ForYourArt added free donuts and a cool show. 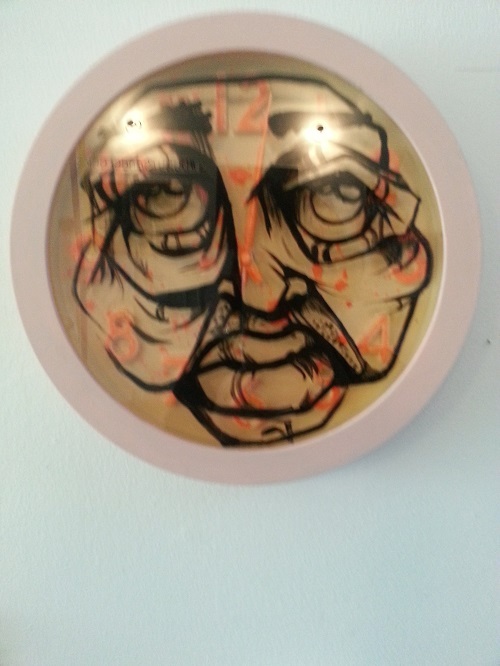 Any artist that wanted to participate could pick up a snazzy clock from ForYourArt and then give it their own spin for inclusion in the show. The clock then went on sale for $99. That means anyone could show their work and possibly have someone take it home. The amount of different takes on the clock made the show worth seeing. Some completely gutted their clock, leaving only plastic and un-ticking hands while one participant kept the clock complete with its box and only added text (talk about ready made). Some clocks referenced pop culture/current events but a lot just sprang from the imagination of these talented artists. Some of which – drum roll – were well-known street artists. I caught photos of the works from street artists still up on the walls. It’s a different sort of canvas for these street art mavens usually posting around the city but their style stayed distinct. Check out work from Louis Cannizzaro, 2wenty, Annie Preece and Gregory Siff. Louis’ piece above is easily recognizable because of the text and signature handwriting. It’s interest that he just layers the paint on with thick brushstrokes so as to obstruct most of the clock. You shouldn’t be thinking of time. You should be thinking about that mystery lover. I admired the works that took only parts of the clock because that meant really tearing into the material to come up with something new. The artists’ personality really shines through but we still get a small hint of a clock with the hands. I’ve never taken apart a clock before but I’m glad the result is so beautiful. Preece’s work had a title that was something like ‘old man’ which you can tell from the large face covering the clock. It’s light-hearted like Preece’s art tends to be but still separates her clock from the other ones in the room. For one, the face is only a few lines but it’s somehow a face that intrigues. Who is this old man? Why is his face on a clock? 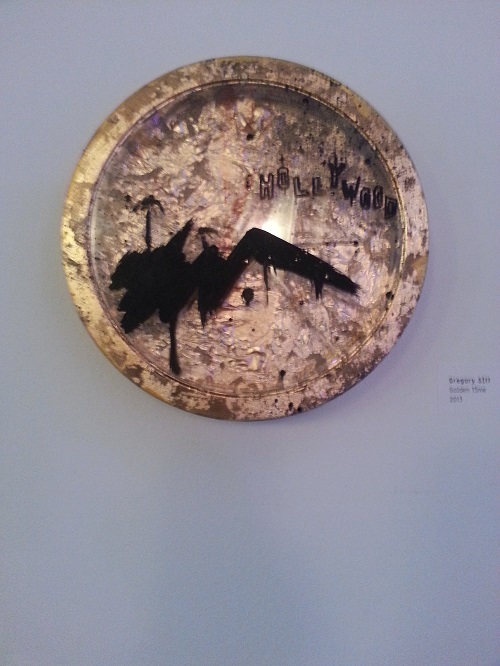 Siff also only had to use a few lines to give away his style with this glitzy clock. It’s an LA piece on the surface but could be a deeper commentary at its core. How much of our time does Hollywood take up in one form or another? We can’t tell because the face and hands of the clock are gone. All we see now is gold. This entry was posted in gallery fun and tagged 2wenty, Annie Preece, art, ForYourArt, Gregory Siff, LACMA, Louis Cannizzaro, street art, The Clock. Bookmark the permalink.